I have now confirmed my blog readers are not only healthcare providers but are ‘actual’ patients. I get questions/emails/comments from them and they made it known to me that they are watching and noticing what we do to their venous access!! LOL.. So in the spirit of sharing and learning, without revealing anything about them, here are a few tips for patients on IV (Infusion) Therapy. 1. Don’t be a creature of habit – allow us to use different veins for sticking (we call it venipuncture). Ok, you know which vein worked the last time you got an infusion , so why not use the same one? Not a good idea, repeated puncture of the same vein will result in damage to the vein lining resulting in phlebitis (inflammation) and sclerosis (hardening) of the vein. Blood flow will not be as good if this happens and can be a problem depending on what you will be receiving. 2. Don’t offer the inner side of your elbow (we call that area the antecubital fossa) to the nurse for venipuncture…it’s really not a good place for an IV! That area works for drawing blood for labs. It is strongly recommended that nurses avoid using an area of flexion like the antecubital fossa. If an IV site in the antecubital fossa swells (infiltrates) because the IV catheter is dislodged, that will limit the use of the good veins below your elbow. 3. Don’t allow nurses to keep sticking you until a vein is found!! You are not a pin cushion! The Infusion Nursing standards of practice states each nurse is limited to two unsuccessful IV attempts. But this doesn’t mean, 6 nurses should attempt twice. In my experience, after two nurses has unsuccessfully attempted (4 sticks by now) , both the nurse and the patient are not feeling so confident at this time. So stop and take a break, have the nurses apply dry heat to your arms/hands and ask them to patiently look for a vein first before attempting another stick. 4. Dry heat improves the success of IV insertion! YES, it is true. Don’t be shy to ask your infusion nurse to apply dry heat (instant warm packs) to your arm/hand to assist in finding your veins. The use of heat increases blood flow allowing for good venous dilatation, thus improved vein visualization. Simply stated, it helps us find “juicy veins”. 5. Yes, sticking an IV (needle) catheter through your skin/veins will hurt! !It’s true, no matter how tough/brave you are, it will hurt to some degree. But the good news is there are topical anesthetic agents (like LMX) that can be applied to your skin prior to the venipuncture to help numb the site. There are other local numbing agents that can be used as well such as buffered lidocaine or even bacteriostatic normal saline. Be sure to ask your nurse about it. 6. Try to relax! Ok, I know this is hard to do when I’m getting ready to stick your arm/hand. Please try to take a deep breathe, hold your arm still but not tense. There is no need to make a fist during the stick. Tense muscles can trigger veins/valves to constrict making venipuncture and catheter advancement difficult. 7. Say something when your nurse flushes your IV line with saline really fast. Tell them to slow down, many patients complain that rapid flushing with saline gives a metallic taste in their mouth that sometimes makes them feel sick. 8. 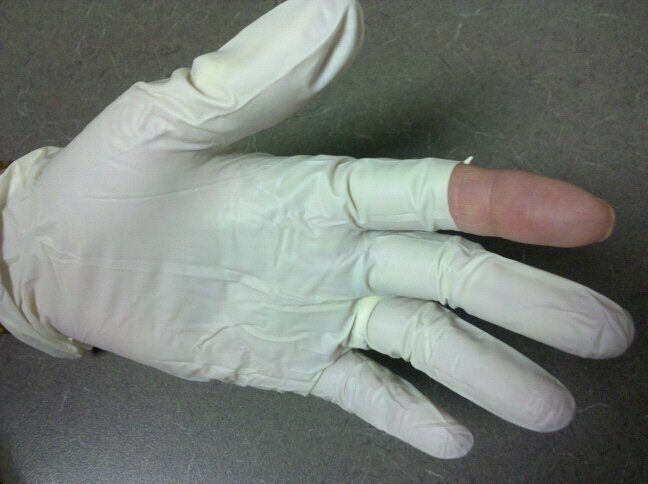 Call the nurse out when you see a nurse not using gloves when they stick you or when they poke a hole in one finger of the glove during the venipuncture. Not good, they can get needle stick injuries. Call them out when you think they didn’t wash their hands when you know they should have. 9. Please don’t mess with the infusion pumps just so your infusion will finish sooner! There’s a reason your pump is set to a specific rate. Some medications, if infused rapidly than recommended can result in poor patient outcomes. So hands off the pump, please! 10. Be an active participant – always ask the nurse what medication or procedure they are about to give or perform. If you are not familiar with the medication name , always clarify and ask the nurse to double check before you take it. Keep an current and accurate list of the medications you take (and bring it with you) – this will be very helpful to us. 11. One last thing: although we stick patients, we are not phlebotomists. An infusion nurse inserts an IV catheter into your vein to “infuse” solutions or medications. On occasion, an infusion nurse may draw blood from the IV catheter immediately after insertion then leaves it dwelling in your veins so you can receive your ordered solutions or medications. A phlebotomist inserts only the tip of a needle into your vein to draw out blood, then the needle is removed when all blood tubes have been collected. Love this info for patients!! Well said!